'Progressive' Fantasy: Weight Restrictions For Candidates! Using weasel-like trickery, a former MSNBC host has suggested barring obese politicians from seeking the presidency. Now of Al Gore's CurrentTV, libtalker David Shuster threw the question out yesterday while filling in for Bill Press. It's a fresh reminder of "progressive" shallowness and an unending desire to exclude from society anyone who refuses to adhere to their rigid lifestyle ideology. But instead of directly advocating the position, Shuster took the slimy way out, posing the question, then pretending not to favor it. Look at that technique using this example: should we slaughter cute puppies and kittens by the thousands? I really oppose this idea, but just thought I'd get your reaction. The net effect: a dangerous concept is recklessly introduced while the host remains off the hook for suggesting it. So David, what exactly is the weight limit for presidential candidates? How about height? Eye color? Style of clothing? 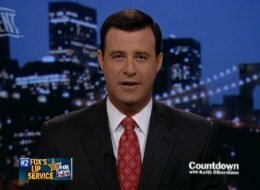 DAVID SHUSTER (BILL PRESS SHOW 30 SEPT 2011): Should Chris Christie be essentially ineligible for president because he, the role model and because he’s overweight? Your thoughts, um and here’s my take on it all. My take is I don’t think he’s too fat to be a great president. I don’t think I don’t think fat or overweight is necessarily an issue in terms of incapacitating him or making him an embarrassment on the world stage because he represents America. No, I don’t believe that at all. I do think however that he can’t get elected because I think there are enough Americans who are concerned about his weight. So in other words I agree that for his own sake both heath and personal but also for his own political sake he should follow the Mike Huckabee diet and exercise plan and try to shed some weight and that would be a terrific role model and I think would help him incredibly politically. If he so happens to run at his current weight and he gets elected, fine by me. As long as he does the job, fine! But I just don’t think he can get elected. Consider this another reminder of the dangerous nature of our "progressive" friends. Too bad Candy Crowley works for CNN. Shuster could have thrown it to that seal for another liberal's POV. Weight limits for candidates? Funny how I see/hear/read this sort of crap from a bunch of media lightweights that are far from household names, even in their own household. Hell, if it were not for media websites like this one, NOBODY would know who these people are. Media figures like Stephanie Miller have dozens of listeners nationally, & yet they still act like they matter. She does'nt, & her ratings, or lack there of, point to that. Listen, I ' ve seen PLENTY of fat-assed Progressive Liberals, so don't even go there! And guess what? Most of them are black. Black folks, especially black women eat their weight in carbs every day. They live on boxes of Mac and cheese and grow fat little kids, prone to obesity in adulthood. They eat fatty meats, if they eat meat at all. I watch them every morning at the employee cafeteria at the Dept. Of Defense...they will eat a Huge plate of scrambled eggs, 6or more strips of bacon or sausage, 4 or more bisquita and cream gravy, the get a diet Coke!! Most of these gals weigh atleast 300 lbs. Plus! At lunch, they will eat 3-4 hot links, collard greens, swimming in ham hock pot liquor and 4+ pieces of buttered, and I mean 6 or more pats or mini tubs of butter! So I don't think that weight limits for presidential candidates, or ANYONE for that matter. If someone wants to glue the insides of their arteries together and theyhave a stroke or at the very least, diabetes, it' their right. MSNBC Talker: What If Rush Killed That Cop?